US connoisseur Robert H. Ellsworth's 11 collections of rubbings of rare Chinese calligraphy works will go under the hammer at China Guardian Auctions' autumn sale from Nov 20 to 24. The Palace Museum in Beijing held an eye-catching show in 1996 on rubbings of rare Chinese calligraphy works, titled Chunhuage Tie. It was based on a collection of US connoisseur Robert H. Ellsworth, a legendary collector of Asian and Chinese art. The four volumes on show were among Ellsworth's 15 rare rubbing collections. The four volumes were bought in 2003 by the Shanghai Museum at a price of .5 million, a worthy treasure, as experts called it, that fills in "some blanks in Chinese calligraphy history". But no one knew where the rest of Ellsworth's collection was until China Guardian Auctions announced in Beijing earlier this month that it will go under the hammer at its autumn sale from Nov 20 to 24. "I've heard of them for years. It's the first time I will see them. This is very exciting," says Zhao Liguang, a former director of Beilin Museum in Xi'an, Shaanxi province. The museum focuses on steles. Rubbings were very important for the preservation of calligraphy works before printing was invented during the Tang Dynasty (618-907). Works of many master calligraphers, such as Wang Xizhi and Wang Xianzhi, were appreciated by their followers only through rubbings left behind. Zhao says rubbings are very valuable because many stones with inscriptions have already been destroyed or are hard to read today. The 11 collections of rubbings from Ellsworth's trove comprise different types of calligraphy works, including two on works of Jin Dynasty (265-420) calligrapher Wang Xizhi, who is considered the greatest Chinese calligrapher in history. According to Song Hao, general manger of the department for rare books, rubbings and manuscripts at China Guardian Auctions, all volumes were bought by the US collector between 1989 and 1995 from Christie's and Sotheby's in New York, and cost him more than .2 million. "In terms of numbers, Ellsworth's collection of rubbings is not large. But the items are rare and well-known," says Song. Song adds that it was rare for a foreign collector to show interest in rubbings when Chinese calligraphy was still difficult for them to appreciate. In fact, even the number of Chinese collectors of rubbings is small compared to those buying ink paintings and antiques today. 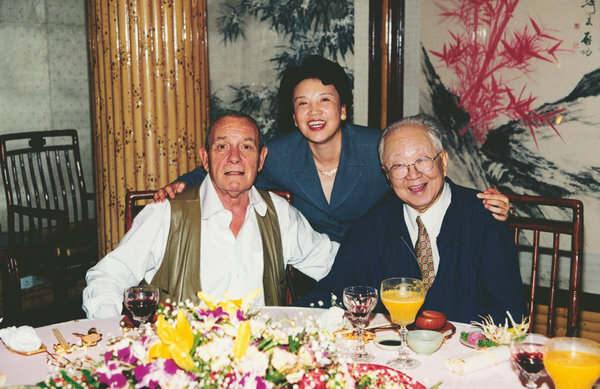 Qi Gong (right), late calligrapher and scholar, and Wang Limei (center), then an official with the National Cultural Heritage Administration, invite Robert H. Ellsworth to hold a show of his collection of rubbings of rare Chinese calligraphy works in 1996. "Usually, collectors who have focused on Chinese art for decades can appreciate the beauty of rubbings. It's difficult to enter this field suddenly," Song explains. The calligraphy rubbings were appreciated by royals, officials and scholars in imperial China. It took knowledge of Chinese literature and calligraphy to understand them. Jin Yunchang, a researcher with the Palace Museum, says Ellsworth's collections cover typical calligraphy works that span from the Qin Dynasty (221-206 BC) to the Song Dynasty (960-1279). 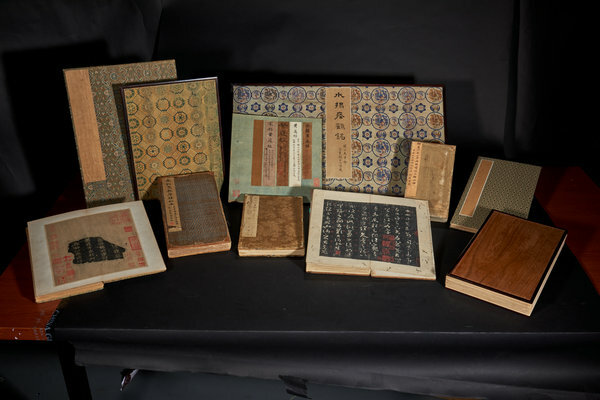 When these volumes were exhibited at the Palace Museum in 1996, museum officials had talked to Ellsworth about their desire to buy some of the rubbings for the museum from him. The connoisseur and art dealer had asked the museum to exchange them with some of its antique jewelry. The museum refused. In 2003, after many rounds of negotiations with Ellsworth, the Shanghai Museum got four volumes from the collection at a record price of .5 million. The four volumes are part of Chunhuage Tie, the most-significant rubbings in Chinese history that cover more than 103 public figures' works, including pieces by emperors, master calligraphers and officials. They are now on display at the Shanghai Museum. As for the remaining 11 volumes to be auctioned in late November, Song says the seller wants to sell them as a whole set instead of giving them to different people. The seller's identity remains a secret. "We can't give an estimated price. It must be a huge sum," says Song. She adds that a single book of rubbings dating to the Song Dynasty can cost millions of yuan based on previous auctions. The Ellsworth collection has seven dating back to the Song era. "It's more than the price. The person who owns it can become a leading collector of rubbings."